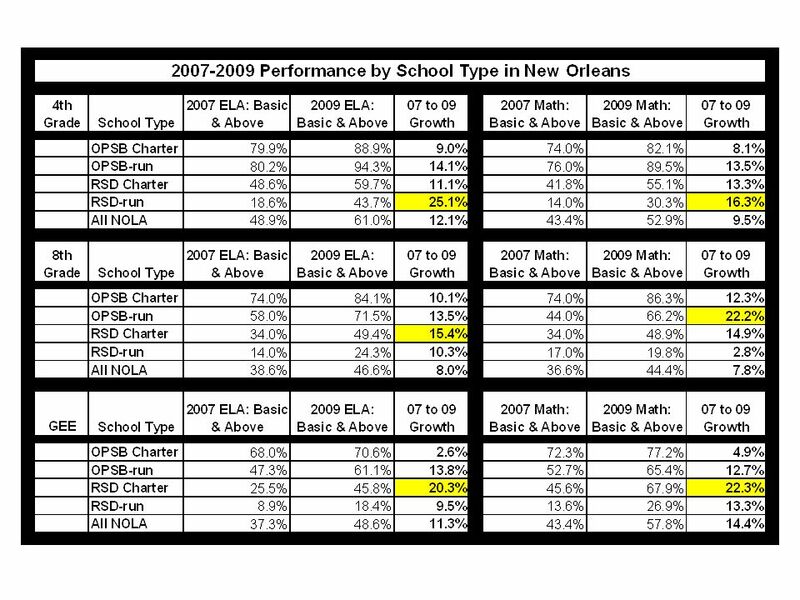 NOPS was widely recognized as one of the lowest-performing school systems in the country. In addition the school system was poorly managed and had significant problems with corruption. 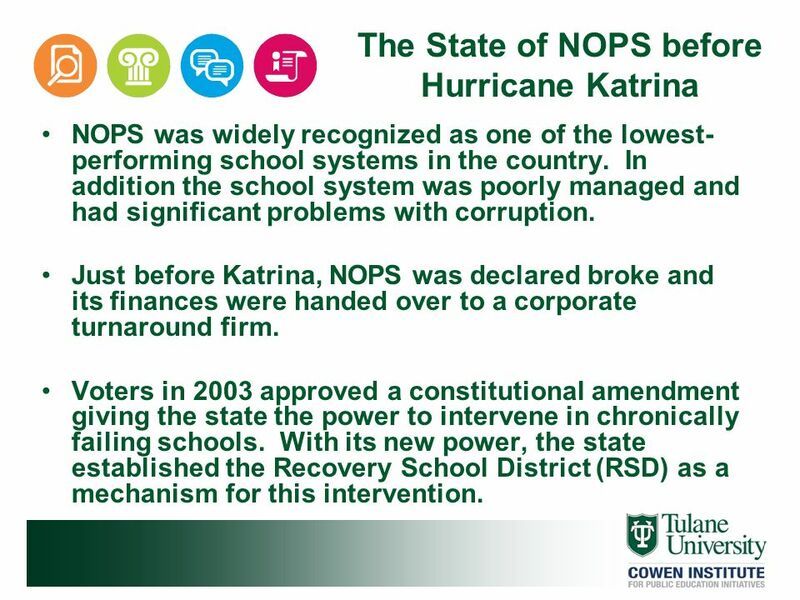 Just before Katrina, NOPS was declared broke and its finances were handed over to a corporate turnaround firm. Voters in 2003 approved a constitutional amendment giving the state the power to intervene in chronically failing schools. With its new power, the state established the Recovery School District (RSD) as a mechanism for this intervention. Management and governance were in disarray. The OPSB engaged in ineffective and illegal practices. By spring 2005, the district was declared broke. The FBI assigned a task force just to investigate corruption in the system. The creation of the RSD was necessary to conform with the LA accountability system and NCLB. This established the foundation for the state to takeover individual schools that met the criteria to be considered failing schools in a failing district. 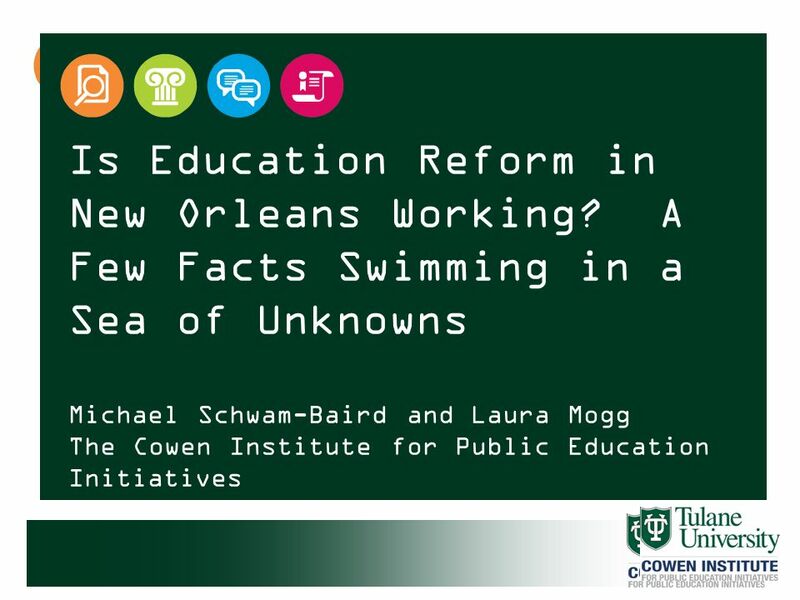 The confusion and uncertainty after the storm were, to some, an opportunity to overhaul public education governance in New Orleans. The legislature, with Gov. Blanco’s support, passed Act 35, expanding the RSD’s authority to take over low-performing schools in New Orleans. With its new authority, the state took over more than 100 New Orleans public schools that were now considered failing. All students and teachers were displaced and many buildings were in poor condition due to neglected maintenance combined with storm damage. The OPSB was unsure when and how it would be able to open schools. This uncertainty led to a number of national experts and researchers to weigh in on what might work best in New Orleans. They introduced the national debates on charter schools, vouchers, privatization, and state takeovers to New Orleans. Act 35, the state’s mechanism for its larger role, was aimed specifically at New Orleans. It raised the school performance score for a school to be considered failing to the state’s average. This made New Orleans the only district in the state to be considered failing because of its number of failing schools. The state takeover was very controversial. Proponents argued that it was a way to prevent pre-Katrina problems from returning. Others said it took away community control and was a way to strip power from the union. The takeover was only the beginning. It allowed for further changes and reforms that were also controversial. 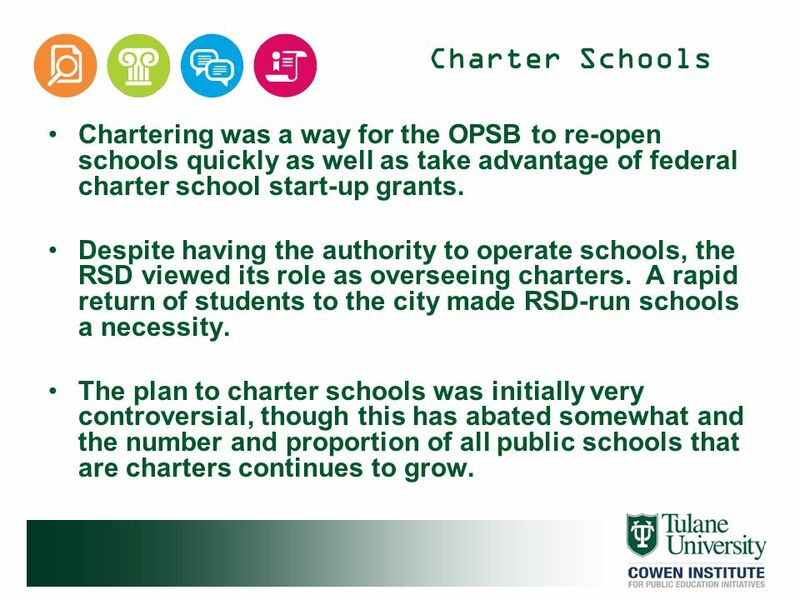 6 Charter Schools Chartering was a way for the OPSB to re-open schools quickly as well as take advantage of federal charter school start-up grants. Despite having the authority to operate schools, the RSD viewed its role as overseeing charters. A rapid return of students to the city made RSD-run schools a necessity. The plan to charter schools was initially very controversial, though this has abated somewhat and the number and proportion of all public schools that are charters continues to grow. 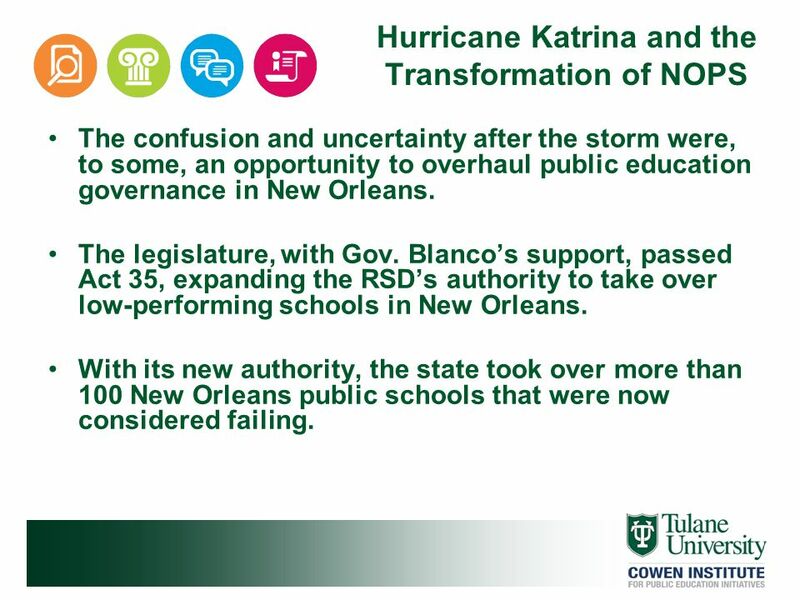 The RSD actually had to open schools and directly operate them because there were not enough quality charter operators right after Katrina and students were returning faster than expected. Blanco’s waiver included having faculty and parents vote on chartering. Accusations included that chartering constituted privatization, that it was an example of disaster capitalism, it was an attempt to gut the union, and the manner in which it was done post-K was a violation of constitutional rights to government participation. Others countered that this would offer increased accountability on the part of schools to parents and students. 7 School Choice School choice options prior to Katrina were limited. 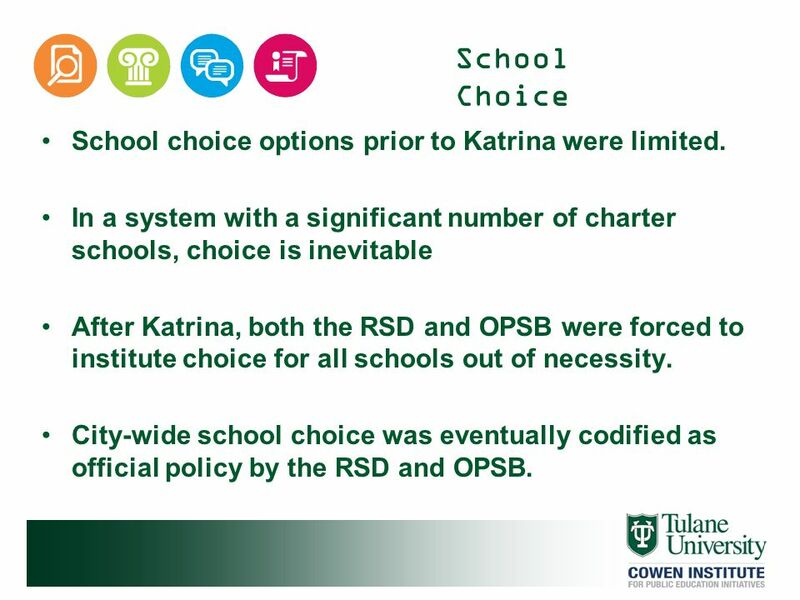 In a system with a significant number of charter schools, choice is inevitable After Katrina, both the RSD and OPSB were forced to institute choice for all schools out of necessity. City-wide school choice was eventually codified as official policy by the RSD and OPSB. The only options for school choice pre-K were a small number of charter schools and selective-admissions magnets. Students who were not accepted to magnets had to attend their neighborhood school. Inevitable choice due to Louisiana law which, with few exceptions, does not allow students to be assigned to a charter school. Choice was also necessary because schools were filling so rapidly. The RSD was forced to open schools continuously where they could in order to accommodate returning students and due to the patchwork nature of residential area recovery and the uneven distribution of less-damaged school buildings across the city. While there is universal choice, all OPSB schools and charters maintain selective admissions policies. Charter and RSD-run schools were not subject to the teachers union contract and selected school-based personnel at the school site. Charter schools are not subject to state tenure and seniority laws. RSD-run schools’ work rules and a salary schedule are established at the district level. Many OPSB teachers are veterans from before Katrina while the RSD has used national organizations to attract inexperienced new teachers. As of January 2006, the OPSB fired all employees that had not already found positions in re-opened schools. The union contract, which covered only OPSB-run employees, expired in 2006. In 2008, teachers at all levels of seniority had higher educational attainment levels. National organizations include Teach for America, New Leaders for New Schools, TeachNOLA, and New Schools for New Orleans. They brought in new teachers, principals, and charter school leaders. 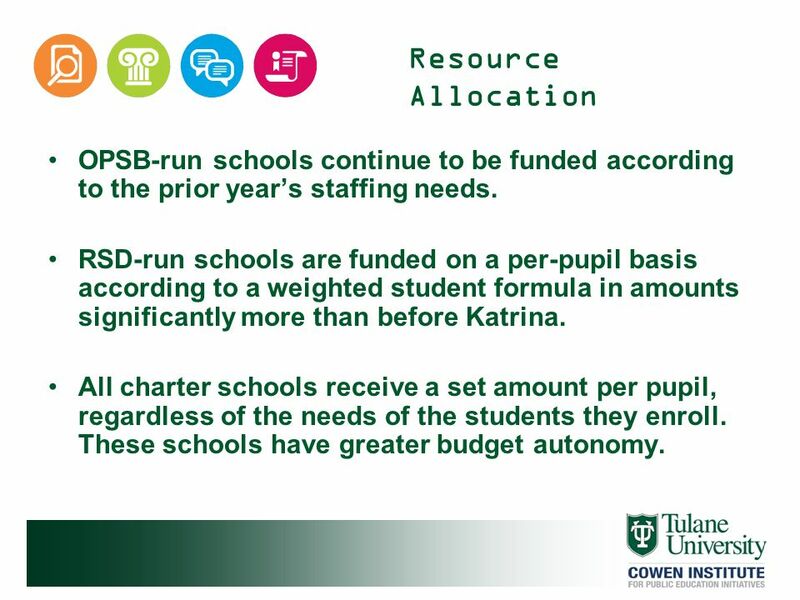 9 Resource Allocation OPSB-run schools continue to be funded according to the prior year’s staffing needs. RSD-run schools are funded on a per-pupil basis according to a weighted student formula in amounts significantly more than before Katrina. All charter schools receive a set amount per pupil, regardless of the needs of the students they enroll. These schools have greater budget autonomy. 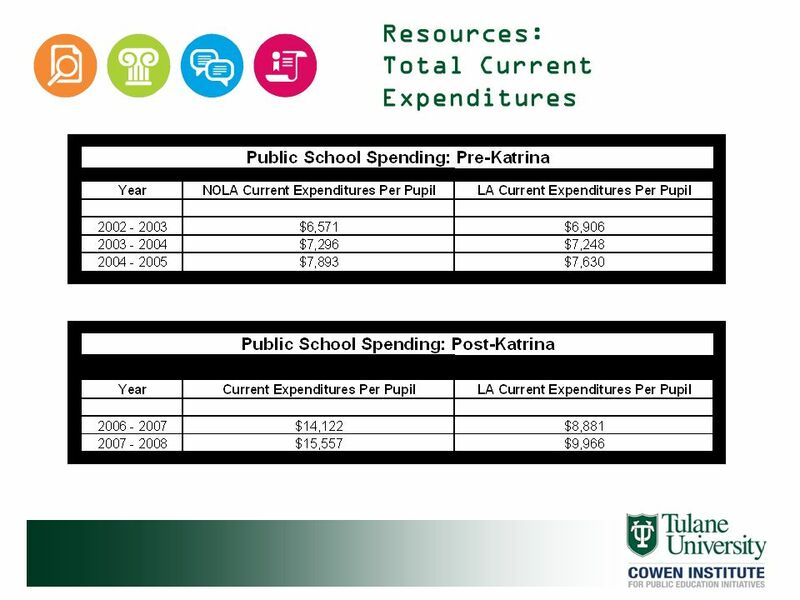 Prior to Katrina, budgets for individual schools and central office departments were based on the previous year’s staffing needs and the salaries those needs demanded. The four remaining OPSB-run schools continue to be funded in the same manner. The weighted student formula has three levels of exceptionalities. There is disagreement about the extent to which these reforms have been implemented and the effects the reforms have had. It is difficult to assess these claims with the information available. 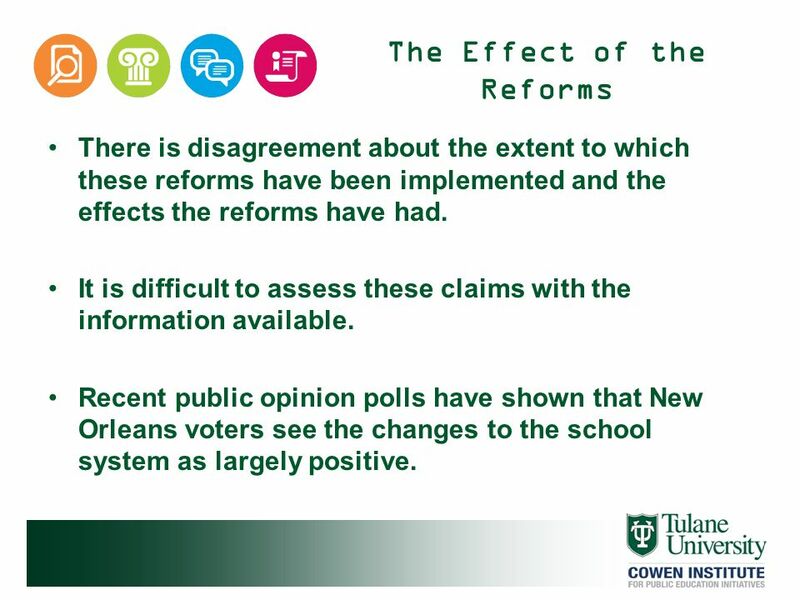 Recent public opinion polls have shown that New Orleans voters see the changes to the school system as largely positive. For example, some parents and advocates claim that school choice does not truly exist due to the lack of information available for parents to make quality choices. For example, 76% of African American parents support charter schools and 74 percent of all surveyed want the post-Katrina changes to stay in place. The same student achievement data has been used to support conflicting positions. Choice has created an educational shopping mall. Parents will not choose low-performing schools and they will forced to close. (Charter advocates) Choice can be a strategy to meet the diverse needs of all children. (Community and political leaders) Many students are still unable to access the city’s better public schools creating a system of high and low performing schools. 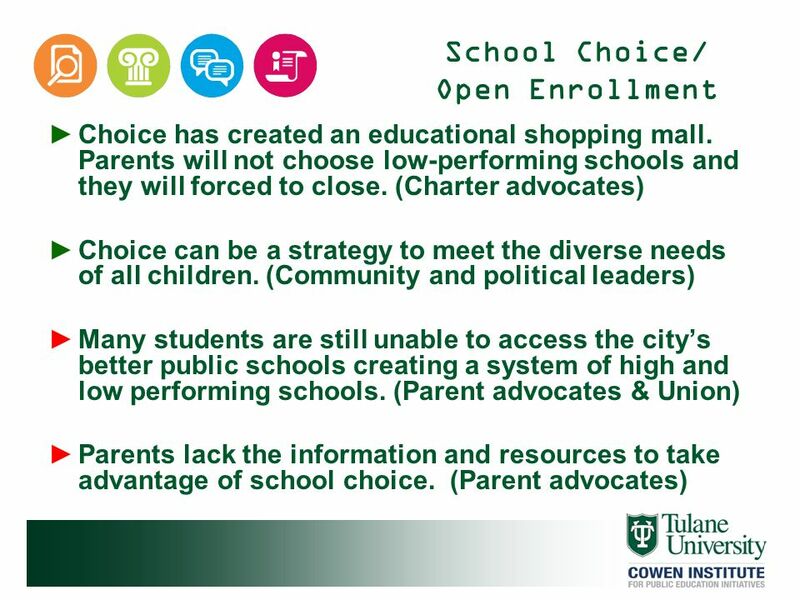 (Parent advocates & Union) Parents lack the information and resources to take advantage of school choice. (Parent advocates) Need to see how we can connect each of these to the evidence and evaluate them. Restricted access due to selective admissions policies, performance requirements, and “de-selection” tendencies at some schools. Parents have a hard time navigating complex system to apply for school and register their children. 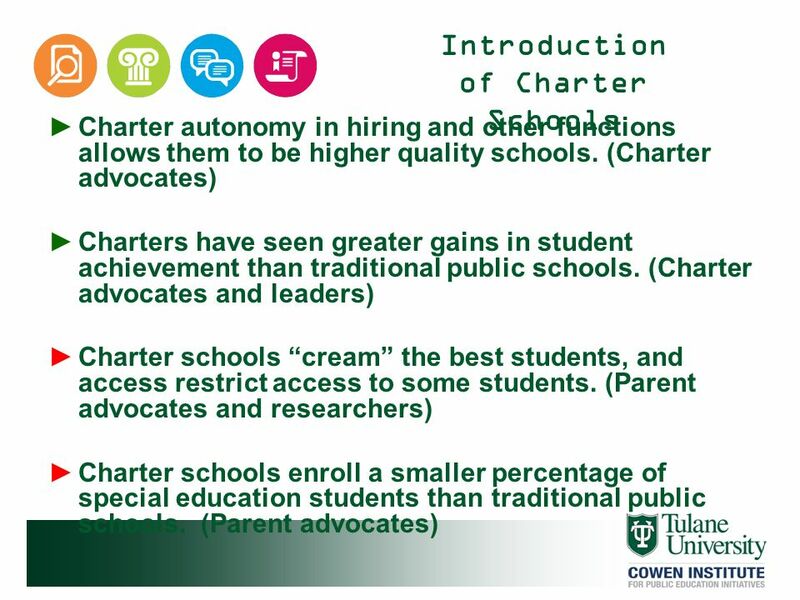 Charter autonomy in hiring and other functions allows them to be higher quality schools. (Charter advocates) Charters have seen greater gains in student achievement than traditional public schools. (Charter advocates and leaders) Charter schools “cream” the best students, and access restrict access to some students. (Parent advocates and researchers) Charter schools enroll a smaller percentage of special education students than traditional public schools. (Parent advocates) Charter schools have increased parental and community involvement. Charters attract more sophisticated parents who can make deadlines, submit multiple applications, etc. Also, parent pledges and contracts, involvement agreements, etc. Charters financially disincentivized to enroll special education students. 14 Human Capital The union’s resistance to change caused problems pre-Katrina. The elimination of collective bargaining provided a fresh start. (RSD and charter advocates) New teachers are motivated, willing to collaborate, and open to new strategies. (RSD) Evidence from national research finds that experienced teachers are more effective at raising student achievement. 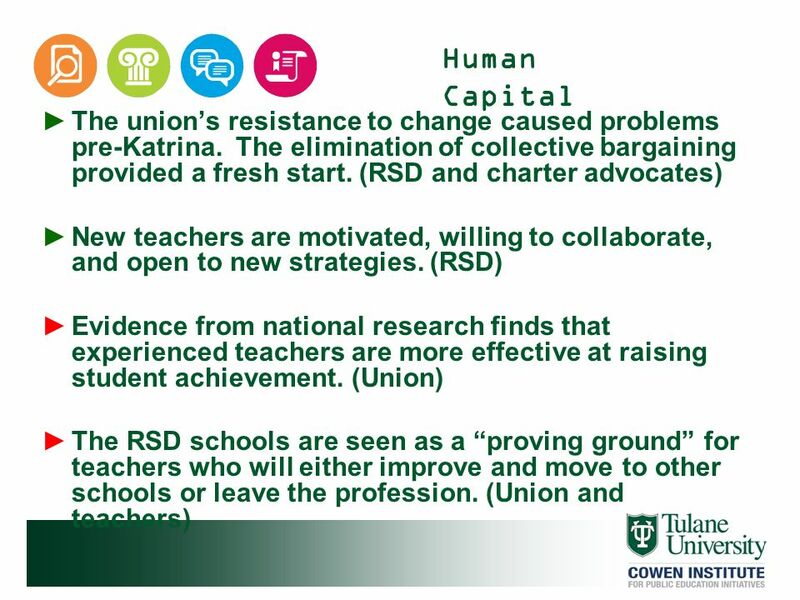 (Union) The RSD schools are seen as a “proving ground” for teachers who will either improve and move to other schools or leave the profession. (Union and teachers) Union resistance to charter schools, state intervention, removing bad teachers from classrooms. 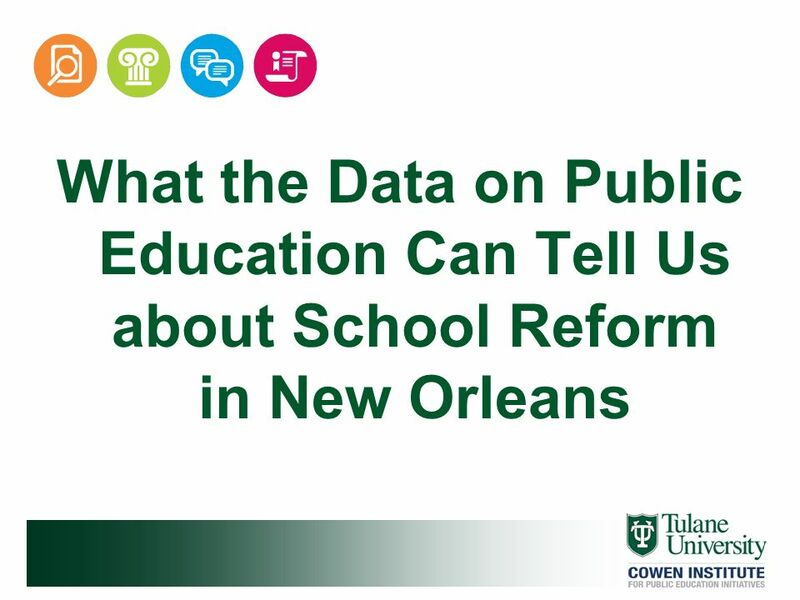 There are only a few years of test scores available since Katrina, and this paper will focus on these school years: 2006 – 2007, 2007 – 2008, and 2008 – 2009. The year is excluded since this was the school year during which Hurricane Katrina struck and many schools were open for only part of this year. 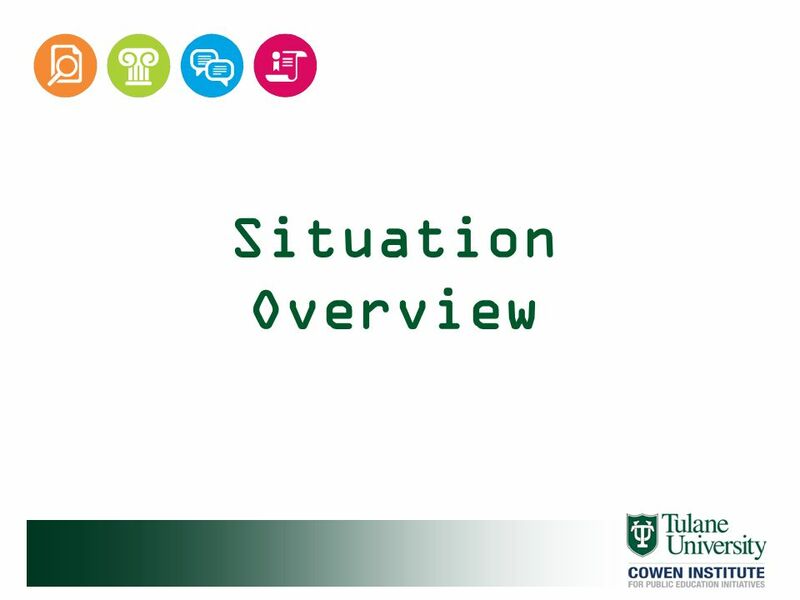 As a comparison to the first three full school years after the storm, we have chosen the three years immediately preceding Hurricane Katrina: , , There are a variety of ways to compare student achievement before and after Hurricane Katrina. Student proficiency rates on grade-level and subject area tests are often used to assess what proportion of students in a given grade meet proficiency standards in a certain area like English Language Arts (ELA) or Math. 17 System-wide Data There are only a few years of test scores available since Katrina, and this paper will focus on these school years: 2006 – 2007, 2007 – 2008, and 2008 – 2009. The year is excluded since this was the school year during which Hurricane Katrina struck and many schools were open for only part of this year. 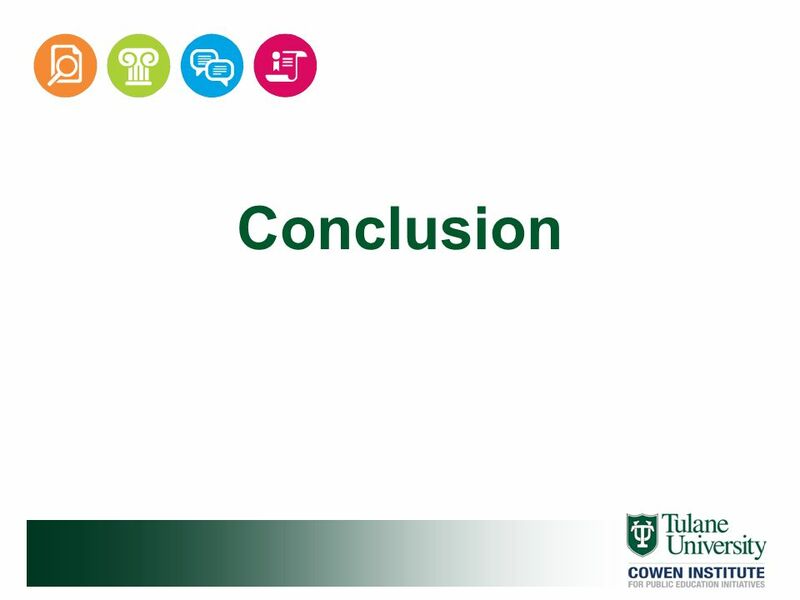 As a comparison to the first three full school years after the storm, we have chosen the three years immediately preceding Hurricane Katrina: , , There are a variety of ways to compare student achievement before and after Hurricane Katrina. Student proficiency rates on grade-level and subject area tests are often used to assess what proportion of students in a given grade meet proficiency standards in a certain area like English Language Arts (ELA) or Math. 18 SPS Scores, why not used. Significantly, proficiency rates grew in every testing area in the 3-year periods before and after Katrina. 19 This indicates that the system was on an upward trend academically even before the storm, and that this general upward trend continued afterwards. It would be nice to see the levels here before just the difference in rates. I should work on this. Then talk about the consequences of the overall data and the school type data for the claims made in the earlier section. 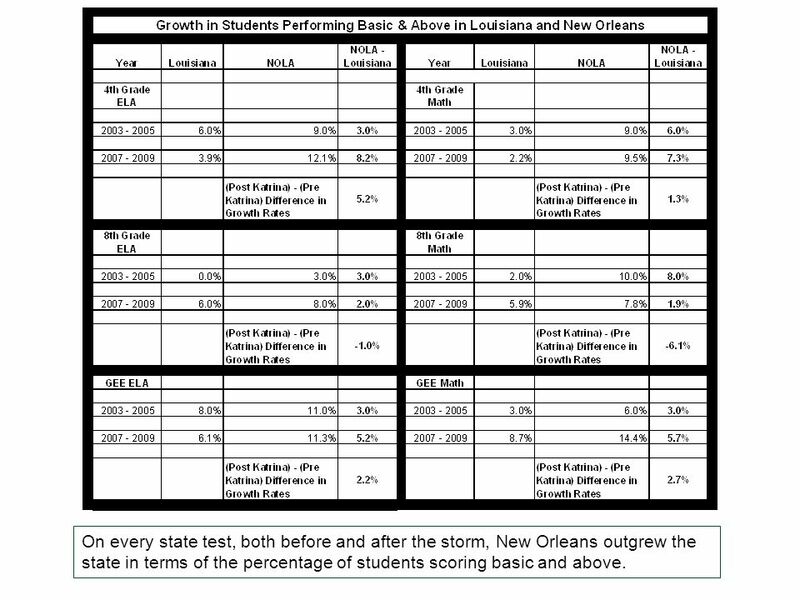 On every state test, both before and after the storm, New Orleans outgrew the state in terms of the percentage of students scoring basic and above. 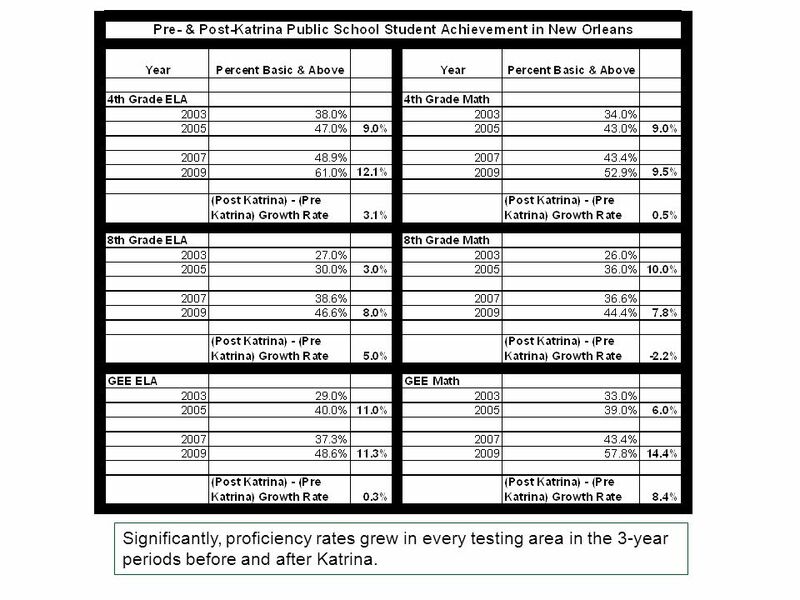 The growth rates in the three years after Katrina show that in three out of six tests the growth rate of public schools has increased significantly. In two of the six tests the growth rate grew by less than one percentage point. In 8th grade Math, the rate of growth has declined since Katrina. In four out of the six state tests, New Orleans outgrew the state at a faster pace after Hurricane Katrina. However, in two out of the six tests, New Orleans outgrew the state at a slower pace after the storm. 21 What does it tell us? 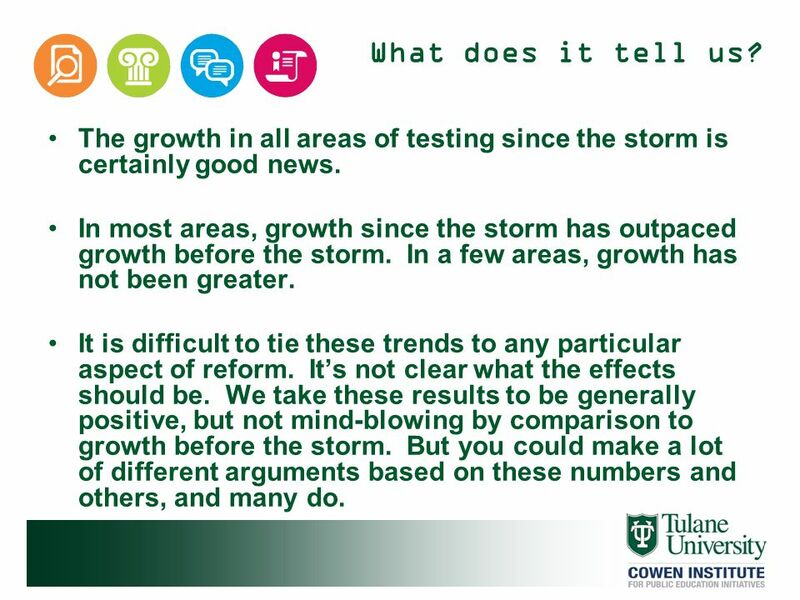 The growth in all areas of testing since the storm is certainly good news. In most areas, growth since the storm has outpaced growth before the storm. In a few areas, growth has not been greater. It is difficult to tie these trends to any particular aspect of reform. It’s not clear what the effects should be. We take these results to be generally positive, but not mind-blowing by comparison to growth before the storm. But you could make a lot of different arguments based on these numbers and others, and many do. All students and teachers were displaced and many buildings were in poor condition due to neglected maintenance combined with storm damage. The OPSB was unsure when and how it would be able to open schools. This uncertainty led to a number of national experts and researchers to weigh in on what might work best in New Orleans. They introduced the national debates on charter schools, vouchers, privatization, and state takeovers to New Orleans. Act 35, the state’s mechanism for its larger role, was aimed specifically at New Orleans. It raised the school performance score for a school to be considered failing to the state’s average. This made New Orleans the only district in the state to be considered failing because of its number of failing schools. The state takeover was very controversial. Proponents argued that it was a way to prevent pre-Katrina problems from returning. Others said it took away community control and was a way to strip power from the union. The takeover was only the beginning. It allowed for further changes and reforms that were also controversial. The proportion of teachers with 0-1 and 2-3 years of experience has increased significantly. 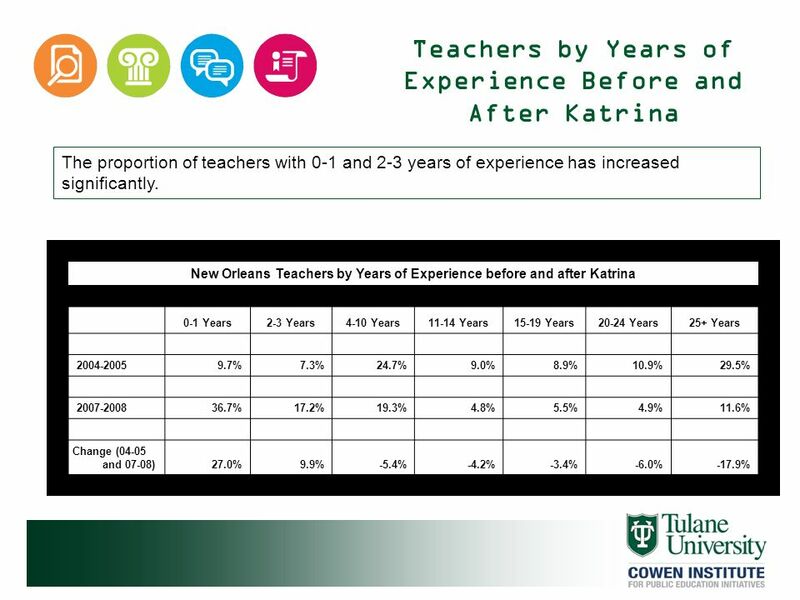 New Orleans Teachers by Years of Experience before and after Katrina 0-1 Years 2-3 Years 4-10 Years 11-14 Years 15-19 Years 20-24 Years 25+ Years 9.7% 7.3% 24.7% 9.0% 8.9% 10.9% 29.5% 36.7% 17.2% 19.3% 4.8% 5.5% 4.9% 11.6% Change (04-05 and 07-08) 27.0% 9.9% -5.4% -4.2% -3.4% -6.0% -17.9% While the performance data is interesting on its own, much of the debate about what the student achievement results mean revolves around the relative influence of changes in the teaching staff, student population, and school resources in the period since Katrina. Teacher quality is widely considered to have a powerful effect on student outcomes. The arrival of many new teachers in New Orleans after Hurricane Katrina has been praised and criticized, mostly based on arguments related to student achievement. The proportion of teachers with 0-1 and 2-3 years of experience has increased significantly, while the proportions of teachers in every other category have declined. The changes in achievement, which are generally positive but do have some negative parts, do not match the dramatic change in the teaching force. Though new teachers could certainly be contributing to improving student achievement, there are certainly other forces at work. 23 What does it tell us? The proportion of new and less experienced teachers has grown dramatically. This does not seem to have had a generally negative effect on the school system, whose results have generally improved since the storm. Predictions of dire consequences from new teachers seem to have been unfounded. Predictions of radical improvement due to new teachers have yet to be proven. All students and teachers were displaced and many buildings were in poor condition due to neglected maintenance combined with storm damage. The OPSB was unsure when and how it would be able to open schools. This uncertainty led to a number of national experts and researchers to weigh in on what might work best in New Orleans. They introduced the national debates on charter schools, vouchers, privatization, and state takeovers to New Orleans. Act 35, the state’s mechanism for its larger role, was aimed specifically at New Orleans. It raised the school performance score for a school to be considered failing to the state’s average. This made New Orleans the only district in the state to be considered failing because of its number of failing schools. The state takeover was very controversial. Proponents argued that it was a way to prevent pre-Katrina problems from returning. Others said it took away community control and was a way to strip power from the union. The takeover was only the beginning. It allowed for further changes and reforms that were also controversial. 24 Student Population The percentages of students who were eligible for free or reduced lunch has changed only slightly since before the storm (77 percent in ; 85 percent in ). Within the category of students who are eligible for the school lunch program, there is a lot of room for variation. The proportion of families living in extreme poverty in New Orleans has declined according to the US Census Bureau (12.3% of families had less than $10K in income in 2005; 6.4% in 2007). This may mean that the proportion of very poor students, who are most likely to have educational challenges, has also declined. Even if the proportion of eligible students is roughly the same, the proportion of students at various levels of poverty or near poverty below the 130 percent threshold could still be quite different. Census data from before and after Katrina indicate that this is indeed the case. For instance, in July 2005 (before Katrina) the census estimated that 12.3 percent of families had a household income below $10,000 (a measure of extreme poverty) and that 38.1% of minors lived in poverty; in 2007, the census estimated that only 6.4 percent of families had a household income below $10,000 and that 31.4 percent of minors lived in poverty. 25 What does it tell us? Not much at the macro-level. 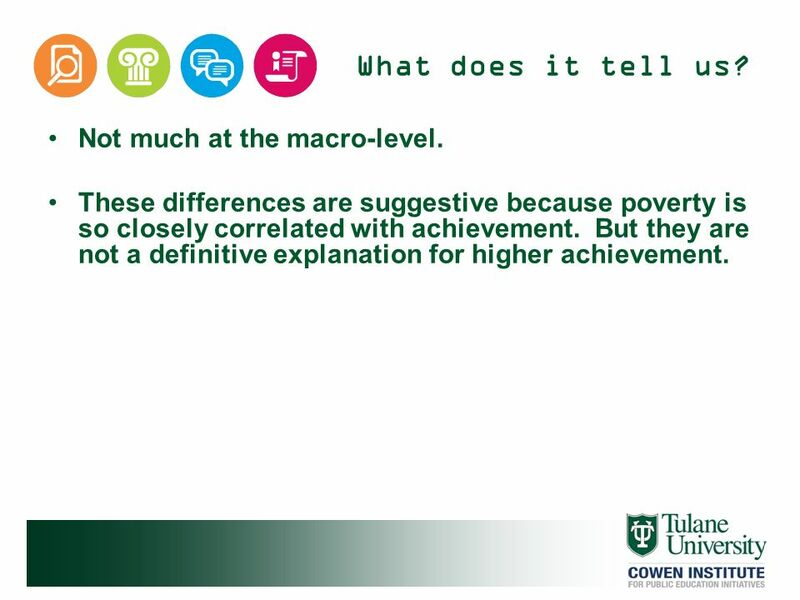 These differences are suggestive because poverty is so closely correlated with achievement. But they are not a definitive explanation for higher achievement. All students and teachers were displaced and many buildings were in poor condition due to neglected maintenance combined with storm damage. The OPSB was unsure when and how it would be able to open schools. This uncertainty led to a number of national experts and researchers to weigh in on what might work best in New Orleans. They introduced the national debates on charter schools, vouchers, privatization, and state takeovers to New Orleans. Act 35, the state’s mechanism for its larger role, was aimed specifically at New Orleans. It raised the school performance score for a school to be considered failing to the state’s average. This made New Orleans the only district in the state to be considered failing because of its number of failing schools. The state takeover was very controversial. Proponents argued that it was a way to prevent pre-Katrina problems from returning. Others said it took away community control and was a way to strip power from the union. The takeover was only the beginning. It allowed for further changes and reforms that were also controversial. One of the more dramatic differences between the pre-Katrina and post-Katrina schooling environment in New Orleans is the difference in resources available to schools. Before the storm, schools run by the OPSB had access to set amounts of local and state money based on the state’s Minimum Foundation Program. In addition, the district received federal monies through the numerous title programs run by the federal government to support specific educational purposes. Following Hurricane Katrina, the federal government committed funds to reopen schools in hurricane-affected school districts; $196 million was allotted to public schools in New Orleans in “restart” federal grants. As of this writing, the state of Louisiana has not yet released current expenditures for public schools in the school year. However, according to the budgets for RSD-run schools, OPSB-run schools, and OPSB charter schools, this figure stands at approximately $14,000 per pupil. This number excludes the large group of RSD charters whose budgets are not posted online. 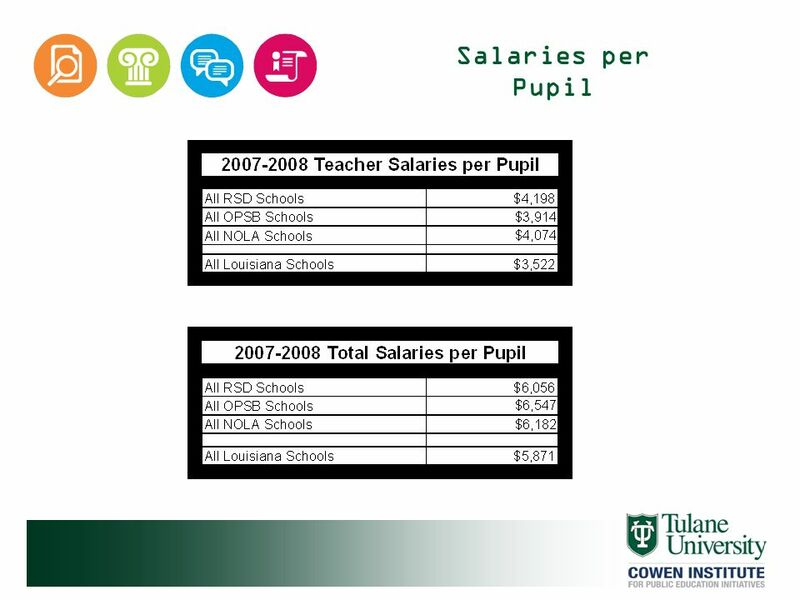 27 Salaries per Pupil New Orleans teacher salaries in in all New Orleans schools, including charter schools, are larger than state averages, but not by much. In terms of overall spending on salaries, including teachers, administrators, aides, and other non-instructional staff, New Orleans schools are even closer to the state average. More resources are being spent on instruction post-Katrina, but most of this extra money is not being spent on teachers. 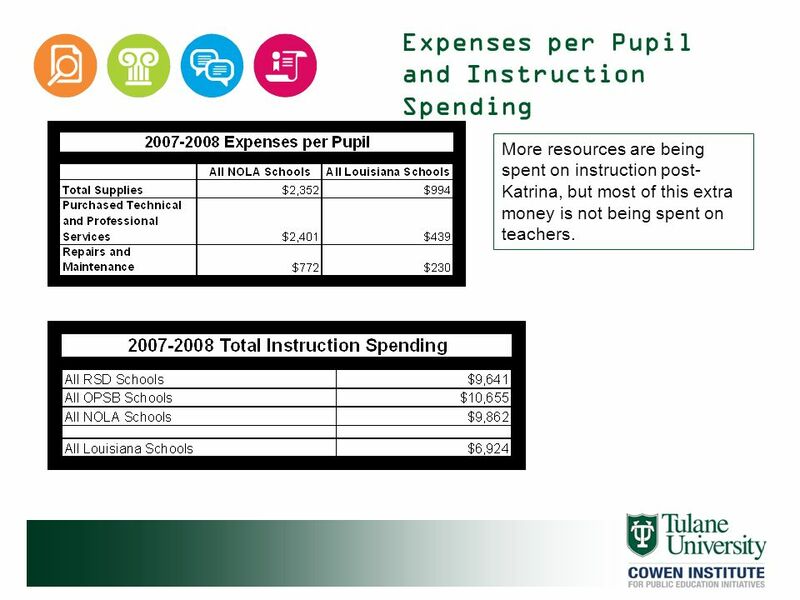 While the main recurring costs associated with instruction are captured by spending on salaries and benefits (which are also close to the state average for public schools in New Orleans), many of the extra spending in public schools are in areas that are not easily separable into instructional and non-instructional expenditures. While the cost of supplies, which includes textbooks, is likely to increase as schools are restocked after Katrina, it is unclear how many of these supplies represent one-time purchases that will last for many years versus purchases that will need frequent replacement and upgrading. The public schools in New Orleans are purchasing a lot of professional and technical services, the details of which are not known. In total, public schools in New Orleans are spending nearly $2,000 more per pupil than the state average on technical and professional services. If any significant amount of these services is related to instruction, then it represents one place where the district has more resources to spend directly on education. The public schools in New Orleans, when breaking out what they spend on instruction, do indeed outspend the state by a wide margin. 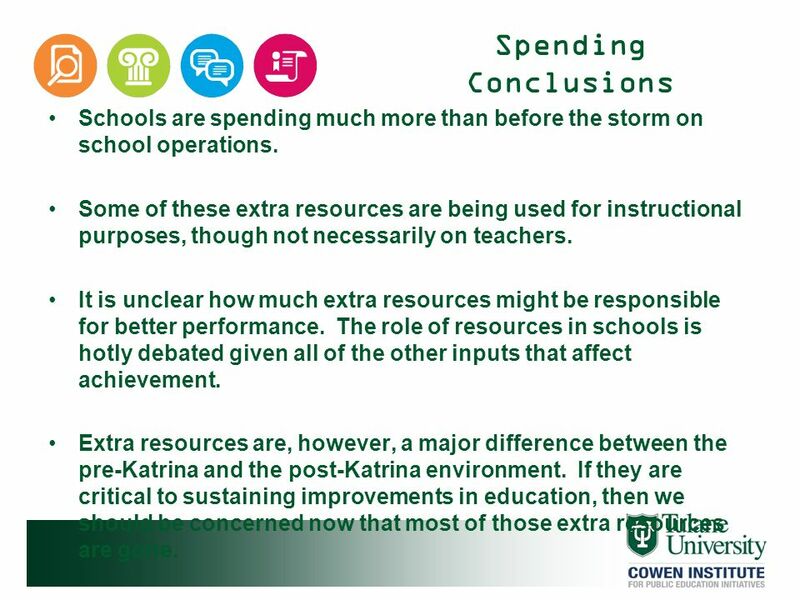 it is unclear exactly how many extra resources are available to supplement instruction in public schools in New Orleans, it does seem likely that more resources are available to schools now, relative to other schools in the state, than were available before the storm. 29 Spending Conclusions Schools are spending much more than before the storm on school operations. Some of these extra resources are being used for instructional purposes, though not necessarily on teachers. It is unclear how much extra resources might be responsible for better performance. The role of resources in schools is hotly debated given all of the other inputs that affect achievement. Extra resources are, however, a major difference between the pre-Katrina and the post-Katrina environment. If they are critical to sustaining improvements in education, then we should be concerned now that most of those extra resources are gone. Even if the proportion of eligible students is roughly the same, the proportion of students at various levels of poverty or near poverty below the 130 percent threshold could still be quite different. Census data from before and after Katrina indicate that this is indeed the case. For instance, in July 2005 (before Katrina) the census estimated that 12.3 percent of families had a household income below $10,000 (a measure of extreme poverty) and that 38.1% of minors lived in poverty; in 2007, the census estimated that only 6.4 percent of families had a household income below $10,000 and that 31.4 percent of minors lived in poverty. 30 Data by School Type There are only a few years of test scores available since Katrina, and this paper will focus on these school years: 2006 – 2007, 2007 – 2008, and 2008 – 2009. The year is excluded since this was the school year during which Hurricane Katrina struck and many schools were open for only part of this year. 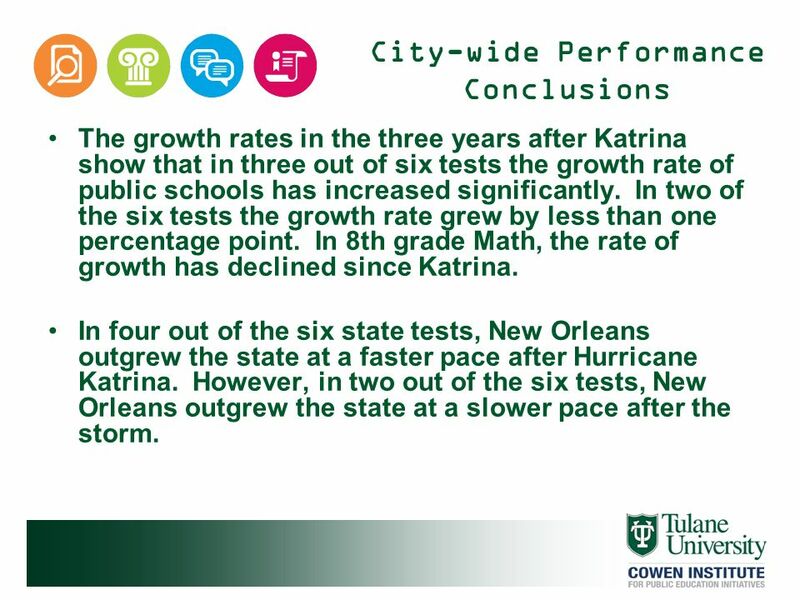 As a comparison to the first three full school years after the storm, we have chosen the three years immediately preceding Hurricane Katrina: , , There are a variety of ways to compare student achievement before and after Hurricane Katrina. Student proficiency rates on grade-level and subject area tests are often used to assess what proportion of students in a given grade meet proficiency standards in a certain area like English Language Arts (ELA) or Math. The school type with the highest growth rate varies by grade-level and subject. No particular school type seems to outperform the others in terms of growth. 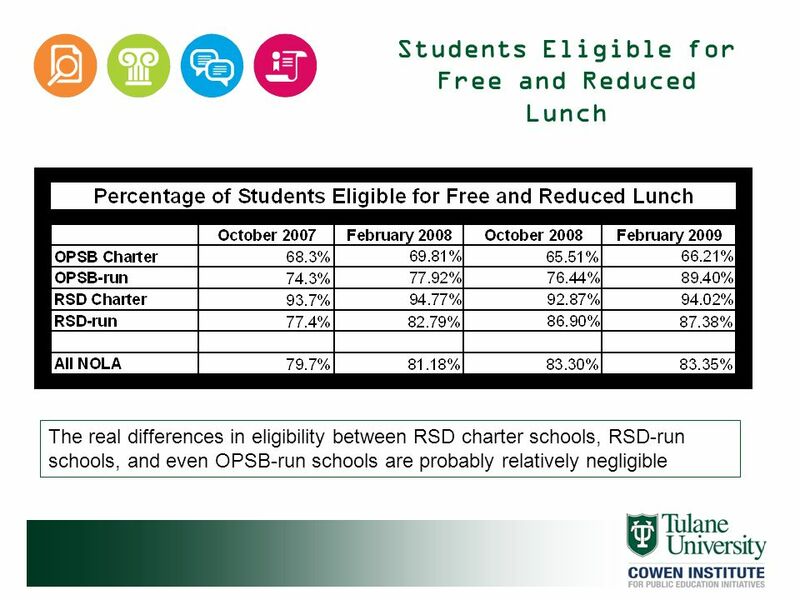 Large differences in absolute scores between RSD-run schools and RSD charters in 2007 indicates that RSD charter students probably entered school with higher levels of preparation, giving some support to “creaming” claims among non-selective schools. 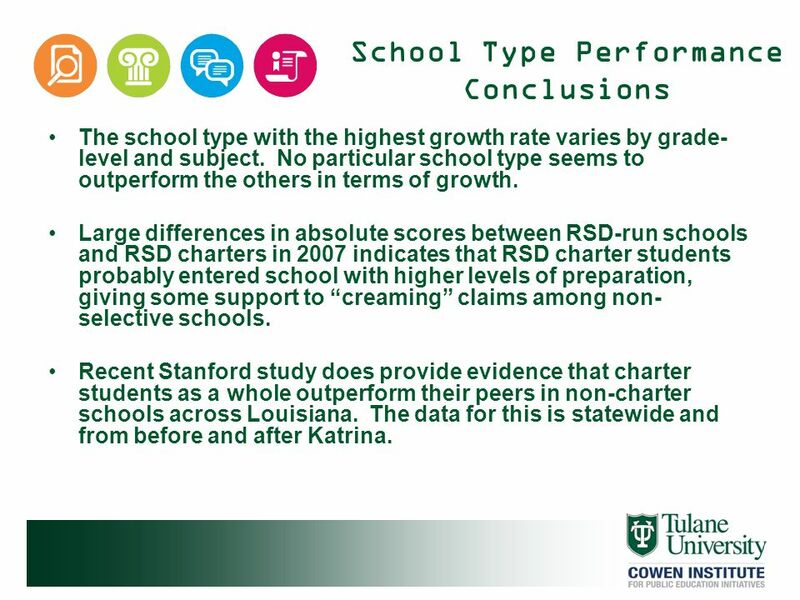 Recent Stanford study does provide evidence that charter students as a whole outperform their peers in non-charter schools across Louisiana. The data for this is statewide and from before and after Katrina. All students and teachers were displaced and many buildings were in poor condition due to neglected maintenance combined with storm damage. The OPSB was unsure when and how it would be able to open schools. This uncertainty led to a number of national experts and researchers to weigh in on what might work best in New Orleans. They introduced the national debates on charter schools, vouchers, privatization, and state takeovers to New Orleans. Act 35, the state’s mechanism for its larger role, was aimed specifically at New Orleans. It raised the school performance score for a school to be considered failing to the state’s average. This made New Orleans the only district in the state to be considered failing because of its number of failing schools. The state takeover was very controversial. Proponents argued that it was a way to prevent pre-Katrina problems from returning. Others said it took away community control and was a way to strip power from the union. The takeover was only the beginning. It allowed for further changes and reforms that were also controversial. 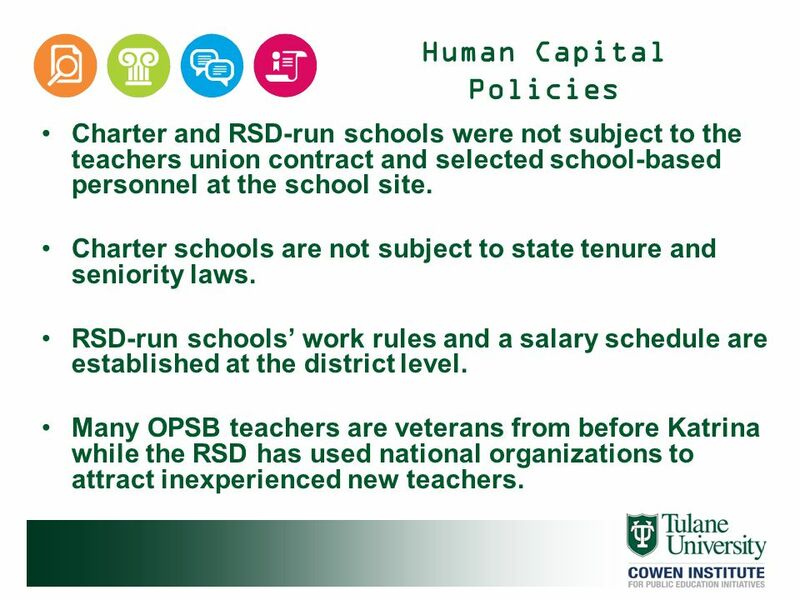 The RSD-run schools have relied heavily on new teachers, while the OPSB-run schools have a large population of veteran teachers. New teachers have not gone into different types of schools at the same rate. While the RSD-run schools have relied very heavily on new teachers, OPSB-run schools have a higher proportion of teachers with more than 25 years of experience than New Orleans schools had before Katrina. Both OPSB and RSD charter schools have a more even mix of experience levels in their schools. While teacher experience and the influx of new teachers could be playing a role in achievement, the connection is far from obvious. It is probably more significant that, after Katrina, schools were allowed to hire the teachers they wanted without regard for central office and collective bargaining rules. 34 What does it tell us? No arrangement of experience levels seems to be particularly associated with better or poorer performance. Schools with large proportions of veterans have shown promising results, as have schools with high proportions of new teachers. Perhaps site selection is the more important variable? All students and teachers were displaced and many buildings were in poor condition due to neglected maintenance combined with storm damage. The OPSB was unsure when and how it would be able to open schools. This uncertainty led to a number of national experts and researchers to weigh in on what might work best in New Orleans. They introduced the national debates on charter schools, vouchers, privatization, and state takeovers to New Orleans. Act 35, the state’s mechanism for its larger role, was aimed specifically at New Orleans. It raised the school performance score for a school to be considered failing to the state’s average. This made New Orleans the only district in the state to be considered failing because of its number of failing schools. The state takeover was very controversial. Proponents argued that it was a way to prevent pre-Katrina problems from returning. Others said it took away community control and was a way to strip power from the union. The takeover was only the beginning. It allowed for further changes and reforms that were also controversial. 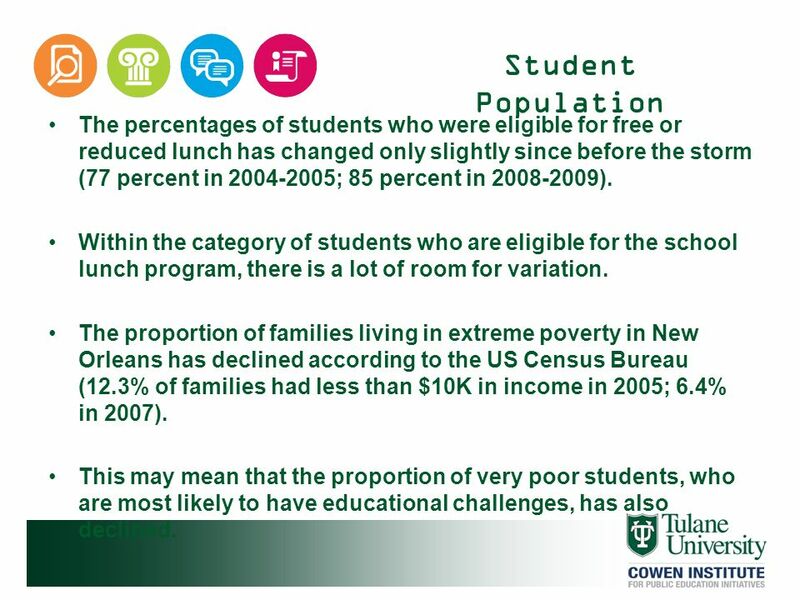 Across public school types in New Orleans, student family income and the proportion of students with disabilities differs. Most students with special needs, except those with extreme disabilities, still take the same tests as all other students. As a result, schools with higher numbers of students with special needs are likely, all else being equal, to score lower on state tests. 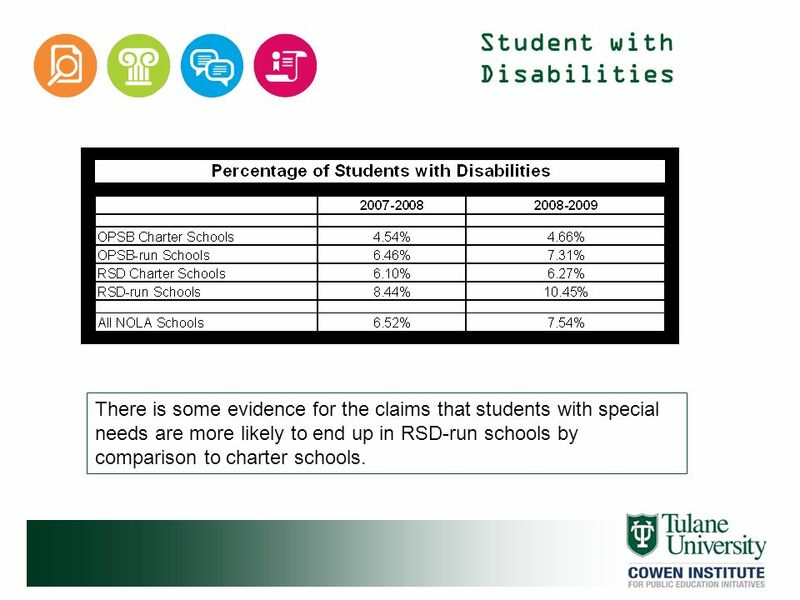 There is some evidence for the claims that students with special needs are more likely to end up in RSD-run schools by comparison to charter schools. 37 What does it tell us? There are not great differences in the proportion of students eligible for free and reduced lunch among non-selective schools, though there could be some variation within income levels that this measure does not capture. 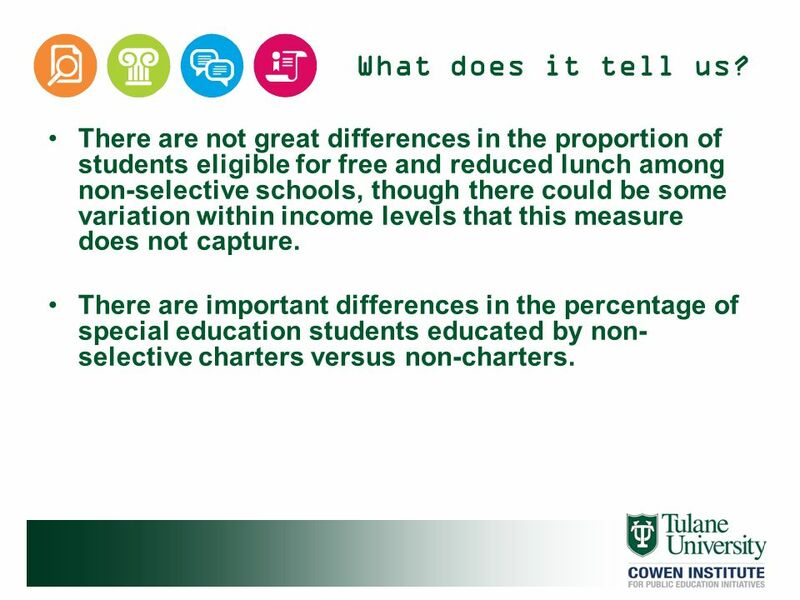 There are important differences in the percentage of special education students educated by non-selective charters versus non-charters. All students and teachers were displaced and many buildings were in poor condition due to neglected maintenance combined with storm damage. The OPSB was unsure when and how it would be able to open schools. This uncertainty led to a number of national experts and researchers to weigh in on what might work best in New Orleans. They introduced the national debates on charter schools, vouchers, privatization, and state takeovers to New Orleans. Act 35, the state’s mechanism for its larger role, was aimed specifically at New Orleans. It raised the school performance score for a school to be considered failing to the state’s average. This made New Orleans the only district in the state to be considered failing because of its number of failing schools. The state takeover was very controversial. Proponents argued that it was a way to prevent pre-Katrina problems from returning. Others said it took away community control and was a way to strip power from the union. The takeover was only the beginning. It allowed for further changes and reforms that were also controversial. RSD-run schools, a category that includes the district’s central office, are spending much more per student than the city’s charter schools, regardless of type. [Though they cannot be broken out the same way, OPSB-run schools and the OPSB central office also probably spend much more per-pupil than charters.] 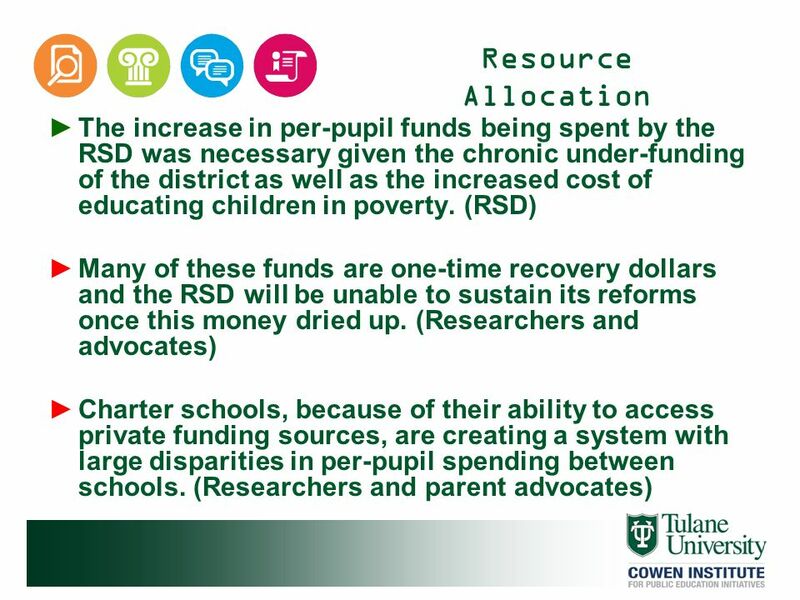 What is not clear from this information is how much of this extra money is being spent on areas directly related to instruction, giving RSD-run schools a resource advantage that might affect student achievement, and how much is being spent on other areas. 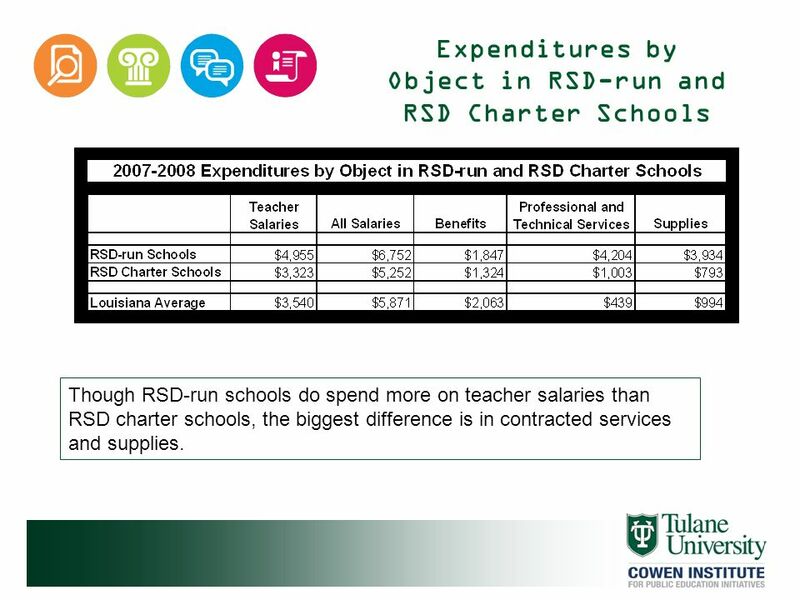 Though RSD-run schools do spend more on teacher salaries than RSD charter schools, the biggest difference is in contracted services and supplies. 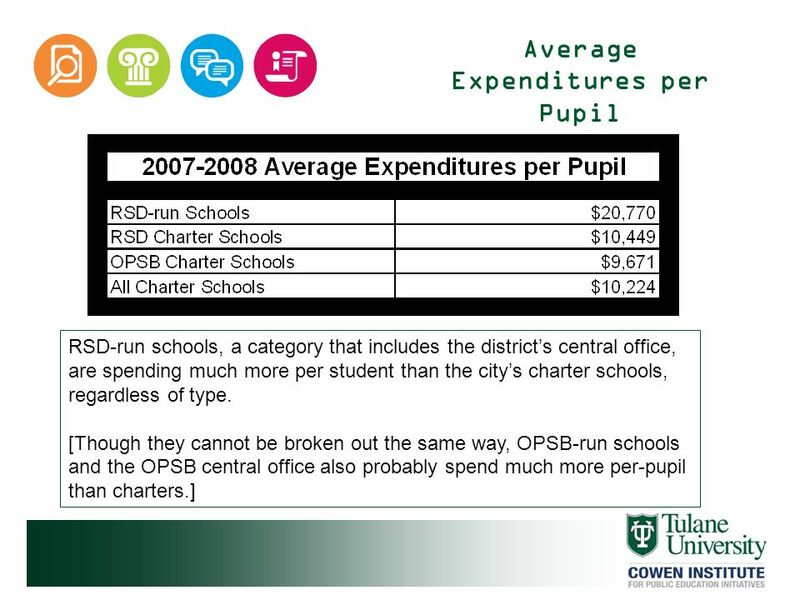 RSD-run schools are spending over $1,500 more that RSD charters per pupil on teacher salaries. More money spent on teachers, assuming it is spent well, would give them some advantage over RSD charter schools. The RSD is spending significantly more on supplies per pupil than RSD charter schools. It is not clear how we should interpret these findings and to what extent different factors are acting on student achievement. While RSD charters have fewer students with special needs and probably attract students with slightly greater academic ability, they also seem to have fewer resources available to them for instruction and other functions than RSD-run schools. Do extra resources balance out a more needy population of students? 40 What does it tell us? There is little evidence to support claims that charters have access to more resources than district-run schools. The RSD is spending a lot of money on operations. While contracted services and supplies may be able to be cut back, the extra money spent on teachers may be more painful to cut when federal money runs dry. All students and teachers were displaced and many buildings were in poor condition due to neglected maintenance combined with storm damage. The OPSB was unsure when and how it would be able to open schools. This uncertainty led to a number of national experts and researchers to weigh in on what might work best in New Orleans. They introduced the national debates on charter schools, vouchers, privatization, and state takeovers to New Orleans. Act 35, the state’s mechanism for its larger role, was aimed specifically at New Orleans. It raised the school performance score for a school to be considered failing to the state’s average. This made New Orleans the only district in the state to be considered failing because of its number of failing schools. The state takeover was very controversial. Proponents argued that it was a way to prevent pre-Katrina problems from returning. Others said it took away community control and was a way to strip power from the union. The takeover was only the beginning. It allowed for further changes and reforms that were also controversial. 42 What We Know Many of the claims made by advocates, union officials, researchers, and public officials are based on shaky evidence. 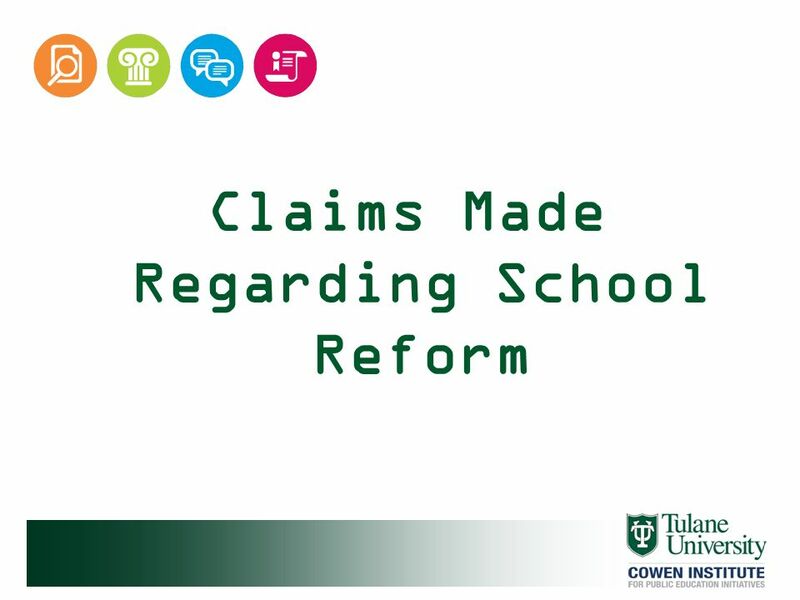 This is due to both the politics of school reform and a lack of reliable data. Overall, student achievement in the city’s public schools has improved since the storm and, in many cases, at a faster rate than before the storm. However, achievement growth is not radically greater than before Katrina. 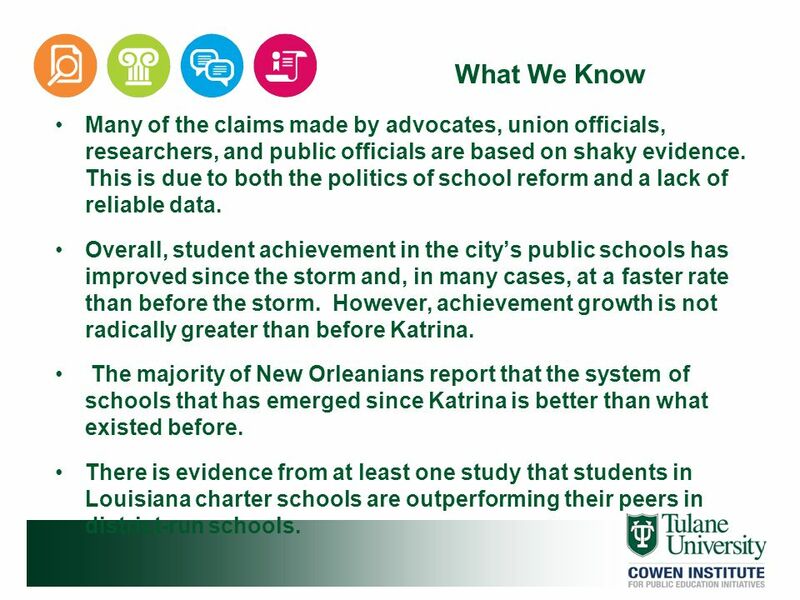 The majority of New Orleanians report that the system of schools that has emerged since Katrina is better than what existed before. There is evidence from at least one study that students in Louisiana charter schools are outperforming their peers in district-run schools. What effect are the many new teachers who have entered the system having on student achievement? Are some more effective than others? To what extent are demographic shifts in New Orleans caused by Katrina affecting aggregate scores across the system? How are the differences in student and family characteristics (including prior student achievement) affecting achievement patterns across different types of schools? How mobile are students? How often do special education students switch schools? What role are additional one-time resources playing? Will their eventual loss negatively impact the performance of public schools? Which reforms are driving achievement the most? With finite resources, this is important! 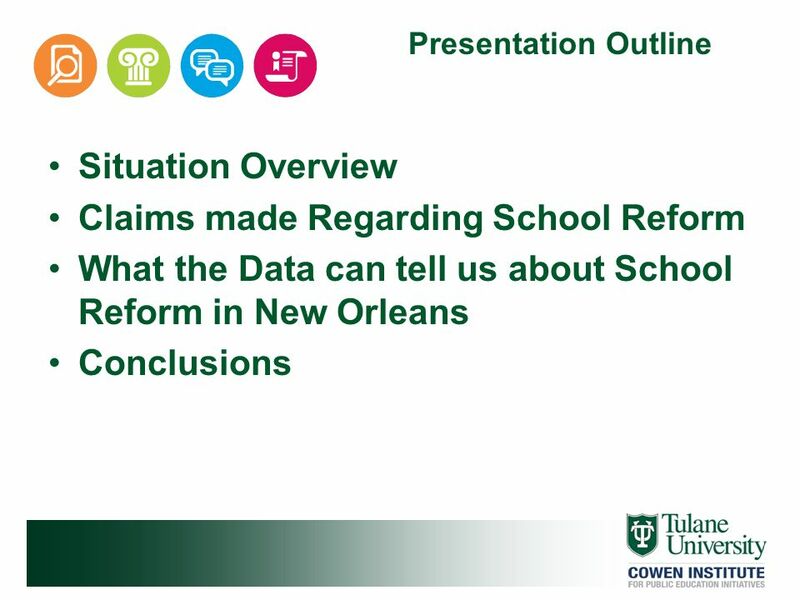 Download ppt "Is Education Reform in New Orleans Working"
Citizens tend to grade their local schools higher than they grade the nations schools. 1 (c) 2008 The McGraw Hill Companies Redesigning Teacher Salary Structures School Finance: A Policy Perspective, 4e Chapter 12. McGraw-Hill/Irwin Copyright © 2012 by The McGraw-Hill Companies, Inc. All rights reserved. Chapter 34 Education. Policy Studies Associates, Inc. Evaluation of the New Century High Schools Initiative Elizabeth Reisner American Youth Policy Forum October 27, 2006. World Study on Poverty and Disparities in Childhood Panama, June 30 th and July 1 st, Childhood and Poverty in Brazil Instituto de Pesquisa Econômica. Demographics And Higher Education In Minnesota Presentation to Citizens League Tom Gillaspy, State Demographer Mn Dept of Administration May 2004. Title I Site Eligibility Ranking & Serving Schools NCLB Technical Assistance Audio March 28, :30 PM March 29, :30 AM Alaska Department of. 1 Adequate Yearly Progress (AYP) U.S. Department of Education Adapted by TEA September 2003. New York’s Contract for Excellence : A Means of Enhancing the Efficient and Effective Allocation of K-12 Education Resources Deborah Cunningham, Matt Reilly. The Funding of Public Education in Wisconsin: Is a Crisis Brewing? Andrew Reschovsky Professor of Public Affairs and Applied Economics Robert M. La Follette. From Districts To Schools: The Distribution Of Resources Across Schools In Big City School Districts Leanna Stiefel New York University Ross Rubenstein.